This month marks the 21st anniversary of the first Moor Laser Doppler Imagers to ship; a product that has helped to define Moor Instruments as a world leader in microvascular assessment. Over the years, LDI has helped fuel the growth of our business and enabled development of the new product ranges offered today. 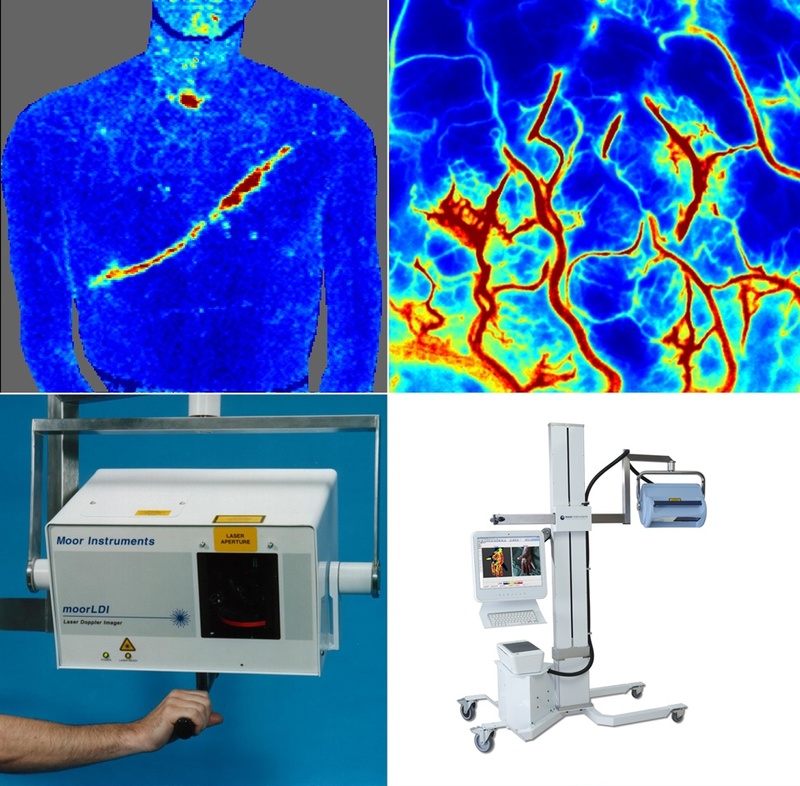 Laser Doppler Imaging revolutionised research into the dynamics and spatial variations of the microvasculature by providing quantitative colour coded images of microvascular blood flow without contact. It has enabled a number of routine applications, from Clinical Burn Assessment to Angiogenesis Modelling (critical to wound healing and cancer suppression drug development and stem cell therapy research). 21 Years on, Moor is the only global provider of laser Doppler Imagers. We recognise that LDI maintains important advantages over newer technologies (such as laser speckle –also available from Moor). First – the penetration depth. The algorithms used together with a focussed beam or laser line directed to the tissue penetrates further than blanket illumination used in laser speckle. This allows visualisation of tissue beds that are further below the surface than laser speckle. In the hind limb model for example, this allows clear visualisation of the femoral artery and collateral vessel formation that cannot be clearly seen with laser speckle. Second – large area capability. LDI is the only technique to offer a single image up to 50 x 50 cm. That is particularly useful for clinical burn assessment where large area burns can be quickly assessed with a single image, rather than trying to patch together a map of 4-5 smaller image files that laser speckle would offer. Thirdly – scan duration and resolution. This is an area where laser speckle has a clear lead and those features fit certain applications exceptionally well – we offer our own laser speckle option, moorFLPI2 in these cases. However, the unique LDI technology patented and still used today in our laser Doppler imagers (continuous moving beam technology) has always allowed us to generate “upper torso” images that are clinically useful from just 40 seconds– a small part of the overall assessment time when considering the full work flow. Using Laser Doppler line scanning (LDLS) will result in much quicker scans (albeit smaller), from just 4 seconds. Finally – we are the only company to have undertaken rigorous multi-centre clinical trials and secured regulatory approval which allows us to offer the only medical device (of any kind) for clinical diagnosis of Burns. We have continuously refined laser Doppler Imaging for 21 years based on the technique pioneered originally by Tim Essex and Byrne of Newcastle – the current product is now in its sixth generation and we are pleased to continue this support for applications where LDI is still preferable and useable. We will also support and develop the newer laser speckle technique, continuing our tradition of adding application-specific functions for better data acquisition and extensive utilities for image analysis. So here is to the coming of age of laser Doppler Imaging – Many Happy Returns! Contact us to discuss your application in confidence and to set up a demonstration – we are always happy to advise.